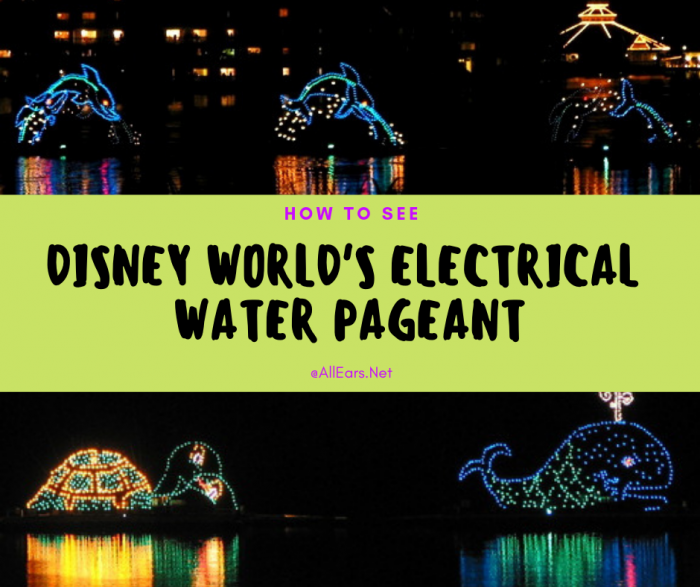 The Electrical Water Pageant is a nightly display that makes its circuit around Seven Seas Lagoon and Bay Lake for the Magic Kingdom area resorts. The pageant consists of two strings of seven barges, each carrying a 25-foot-tall screen of lights. The pageant features King Triton and creatures from under the sea — turtles, whales, seahorses, even a sea monster! — in an aquatic parade set to Disney music (including “Under the Sea,” and the crocodile’s theme song from the film Peter Pan) along with other tunes. Flags and Stars — The pageant concludes with an inspirational salute to America with flags and stars, set to a patriotic musical medley of God Bless America, Yankee Doodle, and You’re a Grand Old Flag. The pageant was originally presented for the dedication of the Polynesian Luau on October 26, 1971. Although the pageant generally follows the schedule below, check with Guest Relations or Lobby Concierge at your resort for times during your stay. Inclement weather can cause cancellation of the pageant. Polynesian Resort — 9 p.m.
Grand Floridian — 9:15 p.m.
Wilderness Lodge — 9:35 p.m.
Fort Wilderness — 9:45 p.m. Contemporary Resort — 10:05 p.m. Note that when the Magic Kingdom Fireworks are scheduled for 9 p.m., the Electrical Water Pageant runs about 7-20 minutes later. From the December 1974 Walt Disney World News: “When nightfall engulfs Bay Lake and the Seven Seas Lagoon at Walt Disney World, a brightly-lighted electrical fantasy beams to life. A crew of sailors ulike any that sailed the seven seas man their boats to present the Electrical Water Pageant, a show that uses more than 50,000 light bulbs to tell its story. The pageant, composed of 14, 40-foot long lighted floats, presents a picture of leaping dolphins, and an array of other sea life, designs and flags. Four outboard motors propel the craft which are mounted with separate lighting generators and an 800-watt sound system.